Reviewed 10/03/2018 by Joseph S.
The Benchmade 943 has been my EDC for over 2 months now and I’m thrilled to bits! It’s solid, beautiful and extremely light, elegant and dangerous at the same time. The blade is visually longer comparing to the handle. The knife is fitted with an excellent Axis Lock which is very safe. It opens smooth and easy and has a great balanced feel. High-quality materials and indisputable quality of treatment and assembly – it’s all about the Benchmade 943. Be careful, this Obsorne knife is really sharp. The blade is made of premium steel of S30V. As for the handle, it’s made of steel and covered with straps made of aircraft-grade aluminum. I’ve heard that some people complain that a handle gets scratched over time. I don’t have any problem with that. Of course, there are some small scratches but it’s absolutely natural. The knife should work but not just lie on a shelf. This folder has been on my want list forever. It was worth the wait. With great ergos, lightweight, and good steel, this Osborne design, is a great EDC knife. I always bought larger knives for EDC and after a while I realized I could buy a smaller knife with less weight and be just as happy.So my first smaller EDC is the Benchmade 943 and I have to tell you I wish I bought this knife sooner.What can you say its a Benchmade.My last EDC was a Benchmade Contego and that was a great knife but just a little bit to big.This Benchmade 943 is perfect in every way.It has a premium steel blade of S30V and at just under 3.5 inches which to me is a perfect length for EDC.The Axis locking system that Benchmade uses is so smooth and fast it just amazes me every time I use it.I have a Piranha auto and I can open this 943 just as fast as the Piranha.I wish they were a little cheaper but it is still a good deal.I guess i'm just a little cheap.When this knife is in your pocket you cannot even tell it is there.Great job Benchmade! Reviewed 04/18/2011 by Jon G.
The Benchmade 943 is a manual action folding knife with a blade length of 3.4" and an overall length (opened blade + handle) of 7.87". Despite the long blade, it weighs a svelte 2.9oz. The "straight clip point" blade is made from the stellar S30V steel. The 943 comes with a relatively straight edge (it's not a wharncliffe, but there's not much recurve either), which makes sharpening easy but it doesn't have as much belly as I'd prefer. The blade is pretty slender with a high flat ground profile, which makes it well-suited to everyday carry and utility work. Very sharp pointy tip, which is useful for detail work and digging out splinters, but is also somewhat delicate, so it might break off if you drop the knife or try to use it as a prybar. If you stick to using your knife as a knife though, it should be totally fine. It came "utility sharp" out of the box, but the edge geometry was a bit out of whack. From the factory, my 943's edge was ground to about 50 degrees inclusive, so I couldn't get it very sharp on my Spyderco Sharpmaker. This issue with edge geometry seems to be a well-documented problem with many Benchmades. After buying the diamond rods for the sharpmaker, I reprofiled the edge to 30 degrees, and it's exactly as sharp as I want it. This knife is EXTREMELY well-balanced. The blade flies out of the handle with a nudge on the thumb stud, yet the in-handle retention is excellent. As it is a manual-action knife, you also have the option of slowly deploying the blade (if you don't want to scare the non-knife people), which is equally easy to accomplish one-handed. Out-of-box, blade lockup was outstanding; like a bank vault, absolutely no wiggle in any direction. However, after flipping the knife open and closed about a dozen times, the pivot screw started backing out. It probably moved back less than [ of a turn, but the side-to-side blade movement at this point was noticeable. A drop of blue loctite inside the pivot screw threads solved the problem, but it would be nice if it didn't have any issues out of box, especially for a $150 knife. This knife is seriously slender! The sculpted black anodized aluminum handles are very comfortable in pocket and in hand, and serve to keep the overall weight down. However, they have a slight chalky texture that you'll either love or hate. They do a pretty good job of maintaining grip, but they certainly aren't the same grippiness as good textured G-10 or Spyderco's bi-directional FRN. Also, while sharpening the 943, I managed to gouge the aluminum handle closest to the ceramic rods pretty nastily. This was my carelessness, but be aware that the aluminum will show scratches and wear. The pocket clip is fairly low-profile and appears to be of identical design to the Griptilian family clips. Tip-up only (which I prefer anyway on non-flipper knives) and repositionable for left- or right-side carry. The clip tension and the moderate grippiness of the aluminum handles are a perfect balance: the knife retains extremely well in my jeans, and does not appear to be wearing out the clothing material. Apart from just the functional aspects, it's worth mentioning that the Benchmade 940-series are very good-looking knives. The blue titanium backspacer is absolutely gorgeous against the black handles, and the overall lines on the knife are very smooth and simple. You need to hold one to really appreciate the aesthetics of the 940 series. I generally do not carry knives with blades over three inches (I have fairly small hands). However, the 943 fits me well and doesn't look like I'm wielding a dagger. The slender handle and low-profile blade design make carrying a large knife practical and relatively non-threatening. While not in the same class of comfort as the Kershaw Packrat, the 943 just feels solid and capable. Granted, I would not baton wood with this blade, but that's not what the 943 is meant to do. Overall: HIGHLY RECOMMENDED. I bought a NIB benchmade 943SBK from a member of benchmadeforum.com on January 6th, and i must say, it is my favorite benchmade so far. The fit and finish is great, opens smooth, and is surprisingly light. I have been edc'ing it exclusively since I got it in the mail, and am more than impressed. The knife carries easily in the pocket with full aluminum handles and a nice, strong pocket clip. The main criticism i have against the knife is the lack of useful jimping. The "jimping" on the back is purely aesthetic, but this is easily fixed with a dremel tool, or griptape if you dont feel like cutting into the knife. The knife centers perfectly, and the axis lock is executed perfectly. The 943 has a 3.4" S30V blade, which is one of my favorite steels for edc, especially since i live in a very humid area, because it resists rust well. I love the contrast of all black blade, handle, and clip with the anodized blue backspacer as well. Overall, this is one of my favorite edc's at the moment. In this review, we will be taking an in-depth look at the Benchmade Osborne 943 Knife. I have carried and used many knives as a US Marine, Law Enforcement Officer, Bodyguard, and Professional Weapons and Tactics Trainer. In my opinion, this is by far one of the best EDC (Every Day Carry) knives I have used to this day. Now let's look at some of the details of this knife that make it such high quality. First up is the blade. It is a high quality steel with a clip-point, with an ambidextrous dual thumb-stud opener, and it's razor sharp. I've been using mine daily now for approximately six months and the blade is just as sharp as it was when I first got it. The length is 3.4" keeping it within legal limits for most laws but still long enough for utility use as well as self-defense. 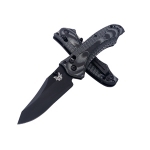 Benchmade makes the knife with different blade choices such as a clip-point straight edge or a partially serrated edge as well as a choice of a satin finish or black finish on the blade. Next is the grip of the knife. The grip is slim, sleek, and ergonomically correct. The length of the knife with the blade closed is 4.47", and 7.87" overall length. I have small to medium size hands and find that this knife fits me perfectly. The handle is made of black, anodized, 6061-T6 aircraft grade, machined aluminum and 410 stainless steel liners. It also has a reversible carry clip that allows for the knife to be carried tip-up. This is a valuable feature for self-defense use for rapid deployment of the knife. The last item is the Axis Locking Mechanism. This is solid and ingenious design on the part of Benchmade to allow for a secure locking of the blade on the knife. Here is the information on the Axis Lock from the Benchmade website, "A patented Benchmade exclusive, AXIS has been turning heads and winning fans ever since its introduction. A 100-percent ambidextrous design, AXIS gets its function from a small, hardened steel bar which rides forward and back in a slot machined into both steel liners. The bar extends to both sides of the knife, spanning the liners and positioned over the rear of the blade. It engages a ramped, tang portion of the knife blade when it is opened. Two omega style springs, one on each liner, give the locking bar it's inertia to engage the knife tang, and as a result the tang is wedged solidly between a sizable stop pin and the AXIS bar itself. (AXIS)"
In conclusion, I give the Benchmade Osborne 943 knife an overall rating of A+. I would not hesitate to recommend this knife to anyone interested in a high quality, durable, and multipurpose knife. One of my top 5 folding knives made by anyone. I like the 943 better than the 941, but I am a fan of clip point knives. 3.4" S30V blade. A very sleek knife that disappears in the pocket. Many think this is a perfect EDC knife. Addictive to those who are into constantly do a flick/close routine. The Benchmade 943 Osborne is simply put, one hell of a knife. It is incredibly well constructed, and feels extremely sturdy. The knife profile is very sleek and the knife is lightweight. The clip is good and it is hard to notice in your pocket. The steel on the blade is great, typical of high end benchmade. The blade has a thumbstud, but I find it easier to pull back on the axis lock and flick the blade out without using the thumbstud. Speaking of the axis lock, very sturdy and solid. I haven't had it long enough, but I have heard the springs need to be replaced after some time. The build quality is top notch, again characteristic of benchmade. My only complaint about this knife is that it is just a little slim, but that's entirely subjective. I have big hands, but for someone with average or smaller hands it would be perfect. Overall, this is an exceptional knife.